Classic Yet Inventive - A Porch or Patio Swing Showcasing Graceful Style! Patio swing sets are classic seating options for the porch, deck or veranda, used for decades by homeowners to create a relaxing area to escape, watch neighbors and sip a glass of lemonade. The St. Augustine A-Frame Swing from Hanamint and Family Leisure takes this traditional form of porch seating and updates it with modern materials and inventive production processes. Everything on this piece, including the hardware, springs, components, frames and cushions, are made for outdoor use. Each piece of cast aluminum undergoes a contemporary eight-stage finishing process that adds protective layers of powder coatings that are baked on for added strength. So that empty area not only gains an outdoor patio swing that showcases an antique, graceful style, but also a piece of cutting edge patio furniture with modern all-weather function. 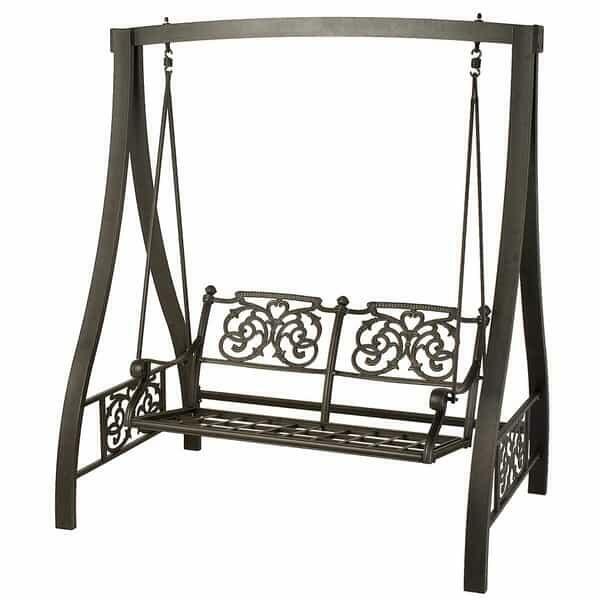 And with Hanamint, homeowners have the ability to build a complete collection around this patio swing set; listed below the features are multiple matching St. Augustine Collections and individual furniture pieces (see below).